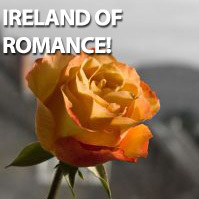 The Ireland vacation experts at myguideIreland have focussed on Romance for our newsletter this Valentines season. Welcome to the February myguideIreland Newsletter. This month, our travel writer Seamus O’Murchu is delighted to inform you about the romantic places of Ireland and their mystic legends. 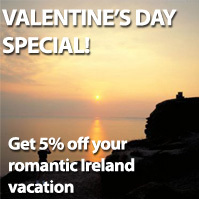 As Valentine’s Day is approaching, myguideIreland is proud to offer you a unique luxury Ireland Tour experiencing the most romantic places in Ireland from just $989 and an extra 5% off if you book by Valentine’s Day. Listing the great romantic cities of the world, the usual suspects would no doubt be Paris, Venice, New York, London, Las Vegas perhaps. But how many people would have Dublin on their lists? Valentine’s Day Special – Get 5% off! Until this time next month – Slan Go foill! This entry was posted in Ireland travel and tagged Ireland vacation, ireland vacations, vacation in ireland, vacation ireland.